If you are ready to start to MAKE MONEY online, then this is the place to do it! We will give you the keys to build your Downline, to create your own Downline Program and to learn winning techniques so that you can sit back and let the earnings begin! We have all heard the experts boast about how many millions of dollars flow through the Internet and E-Commerce each year. Have you ever wondered to yourself when you will get a chance to enjoy some of that revenue? Well, your opportunity is here! If it is true that all this money is flowing through the Internet then there is no reason that you should not have your piece of the pie. We are here to assist you in getting your piece of the pie so that you can eat it too! Our Downline Builder Tool makes use a special script that is designed to offer maximum Downline building capabilities, with as little hassle as possible. The great thing about our tool, is that it can be used to build up your existing downline as well as to create brand new downlines from scratch. With our special reseller program you can create a big stream of affiliates for your websites and also earn a good income by just selling this script! Our reseller program is specially designed to offer maximum affiliates building capabilities, with as little hassle as possible and make good income from it. As a reseller we will give you a special opportunity by which you can tell us your 2 websites / programs and we will insert them in your script which you are going to sell and then all the copies that you will sell will bring you money and also affiliates to your websites . 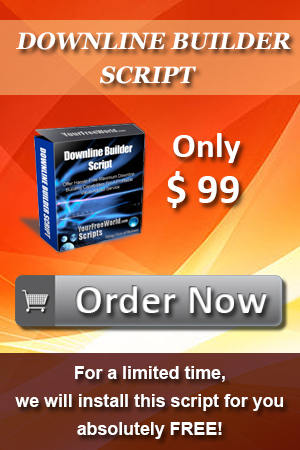 As a reseller you can sell the script for any price that you wants but you are not allowed to give it away for free. If all these 100 websites get 100 members each , so you will get 10,000 members to your 2 websites / programs that you had in the script. So the more scripts you will sell the more money you will make and more affiliates you will get. This is only a projection, not a guarantee of income and traffic as it always depends upon your efforts and your clients efforts. Our system is designed it to have you up and running and earning money in absolutely no time at all. This is the reason that we have made the tool so easy to use. You can add as many programs as you wants and build up the downlines for all those at once only. You can use this tool to build the downline for any particular targeted program(s) or Misc program(s). You can keep track of members and mail them. Members can join all the programs added by you and add there affiliate ids and then they can promote a single url and build the downline for all the programs at once. Come see for yourself! Check out the Free Live Demo to see how it all works!! Furthermore, with your username and password you can log into the admin area and use this script to add an unlimited number of programs and then promote them all from one single web site. Members can offer their own programs to there downlines . You can set the number of programs allowed by members to offer to their downlines. You can set the number of levels deep members can offer their programs. You can offer free and paid both membership. You can set the paid membership duration like monthly / yearly / lifetime. You can set the paid membership fee. You can set the referral commissions till as many levels deep as you want. You can set the number of programs allowed by free members to offer to their downlines. You can set the number of programs allowed by pro members to offer to their downlines. You can set the minimum withdrawal limit. You can set the free membership to expire automatically after a certain amount of time. Now, you may be asking yourself who can use this tool and is it right for you? The answer is, YES! This tool IS for you! If you are the owner of a single web site or of multiple domain names then this is an excellent tool for you and a way to earn more income. Order now! We are currently running a promotion. These scripts usually sell for double the price but right now you can own a single user license for just $99!!! 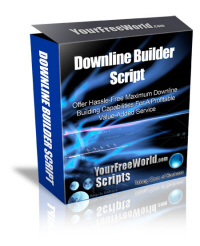 Already Own Downline Builder script want to upgrade to another version* - Click here to contact us with the details of your earlier purchase and the url at which you are using the script. Click Here to view the sites using our Downline Builder script. Installation is not free until you purchases Single Usage License with installation. With Reseller rights only you can sell our script. Resellers are allowed to sell the script at any price of their wish.